In the mobile game space, it’s rare to find anyone who hasn’t yet heard of global gaming phenomenon Fortnite Battle Royale. After hitting $1B in revenue in less than a year, Epic Games’ Fortnite is on track to become the most financially successful free game on consoles of all time. The meteoric success of this multiplayer shooter game has almost never been witnessed before. Originally just available on desktop and consoles, the game launched on iOS in April 2018 and has since received over 100M installs, earned an estimated $160M in revenue, and has seen daily mobile revenues of up to $2M. The game is currently on pace to hit half a billion dollars in in-app purchase revenue around April 2019. Astonishingly, these milestones have been based off the game being available only on the Apple App Store. Launching an app on one platform first is a common strategy for mobile game publishers. It garners the support of Apple or Google and leads to heavy featuring and advertising within the top charts, suggested app recommendations, and the app stores’ homepages. However, Epic Games are about to employ a strategy that’s never been seen in western markets—bypassing the Google Play Store altogether (and its 30% fee) and channeling Android downloads through an Android Package Kit (APK) download on their website. But, will this turn out to be a profitable business strategy? In Part 1 of this 2-part post series, we’re unpacking Epic Games’ controversial distribution strategy, identifying the potential conversion rate (CVR) drawbacks, and estimating the loss in potential installs they may experience by not launching on Google Play. Part 2 will delve into how we believe this strategy will impact the mobile app ecosystem as a whole. March 2017: Using Epic Games’ Unreal Engine 4, PlayerUnknown’s Battlegrounds (PUBG) launches an early access title on desktop. After significant success during that period, they fully launch in December 2017. In March 2018, they launch a mobile version on both Google Play and the App Store. September 2017: Fortnite launches their own version of the Battle Royale genre on desktop and consoles, quickly capitalizing on the evident product-market fit of PUBG’s hit. PUBG clone or not, Fortnite begins to show signs of becoming a massive success. Monetization and user acquisition (UA) costs on iOS are typically higher, making Apple’s support that much more valuable. Knowing they could potentially launch outside of the Play Store, building hype and attracting an even wider player audience were key to achieving success. As Fortnite grows on iOS, Android users must wait patiently, which creates anticipation and makes them even more eager to download the game on their devices any way they can. August 2018: Epic Games choose to bypass launching Fortnite on the Google Play Store, which shocks the entire app developer ecosystem (likely after understanding the economics of lower conversions, which we’ll touch on below). 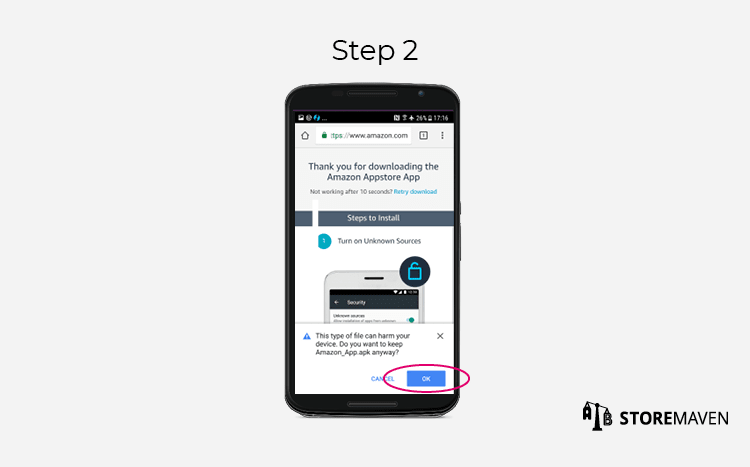 Gamers are instead directed to Fortnite’s website to download an APK file to their Android device—an experience that adds several intimidating steps to the install funnel. A decrease in CVR due to a sloppy and unfamiliar APK download funnel, which we showcase towards the end of this post. Less installs due to security concerns. 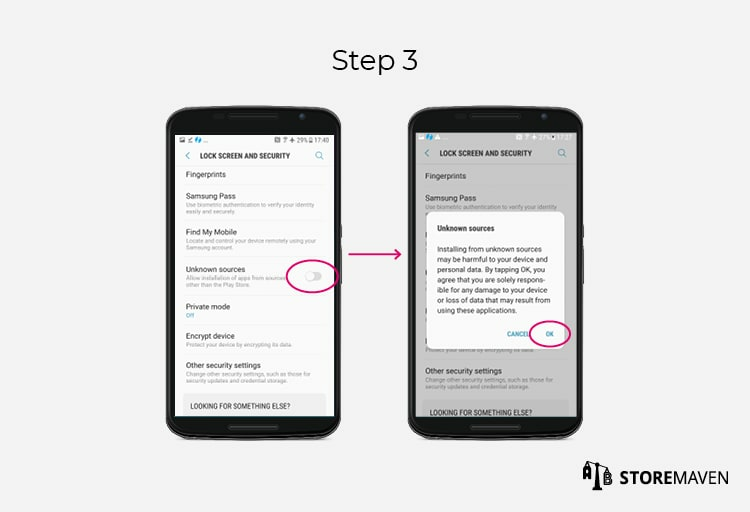 Downloading a file outside of the secure Play Store opens up the opportunity for malware to infiltrate Android devices, and users may be tricked into downloading suspicious copycat apps through other websites. In fact, this has already happened. This is especially concerning for Fortnite’s younger players who may not know the difference between legitimate or fraudulent sites. Although Google mentions that Fortnite Battle Royale isn’t available on the Play Store when people directly search for it (which prevents the proliferation of fake Fortnite apps), they don’t point people to the legitimate website to download it. These security vulnerabilities could easily deter potential installers. Lower installs driven by the lack of discovery through the Play Store’s top charts, featured apps section in the homepage, and search. This will especially limit Epic’s ability to convert casual, mid-core, and non-gamers that otherwise could have passively discovered the game while browsing the Play Store. Increased competition by PUBG and future Battle Royale clones who will get Google Play’s support. In fact, Google highlighted PUBG on its homescreen and currently showcases PUBG and other top competitors when users search for Fortnite on the Play Store. Overall, Epic Games are creating a huge barrier to entry while at the same time removing free advertising that Google would have definitely done to boost its own revenue. As you can see in the image above, Google have already begun promoting Fortnite’s top competitors on the Play Store both in the homepage and Search Results Page. On the Google Play Store, all installs come from either organic or paid traffic. Search, where users discover your Store Listing by directly searching for your brand, or by searching relevant keywords and seeing your app or game in the Search Results Page. Browse, where users discover your Store Listing through top charts, featured app pages, or Google Play’s navigation tabs. Paid traffic includes installs from users who arrive from paid UA campaigns through sources such as Facebook, Google, or network traffic. Based on our analyses of the Google Play Store Listings of leading mobile game publishers, we’ve found that about 51% of installs on Google Play come from organic traffic and 49% of installs come from paid traffic. Although Google takes a 30% fee for distributing on its platform, it’s evident that the Play Store enhances app and game discoverability and drives organic conversion. For an incredibly strong brand like Fortnite, it wouldn’t be a stretch to imagine that around 90% of their installs currently come from organic sources given the amount of hype surrounding the game. However, as the hype dies down, this percentage is likely to move closer to 60%, which is the percentage we use in our below calculations. We estimate that browse traffic will experience a 70% hit to installs. Although browsing the Play Store isn’t an option, we assume that about 30% of those who would’ve discovered the app by actively browsing the top charts or navigation tabs have high intent and would actually take the steps to search for and install the APK. We estimate that the APK download process will create a 30% hit to installs that would have come from branded search on Google Play. This is mostly due to the 6-step process of downloading an APK that can deter installers. 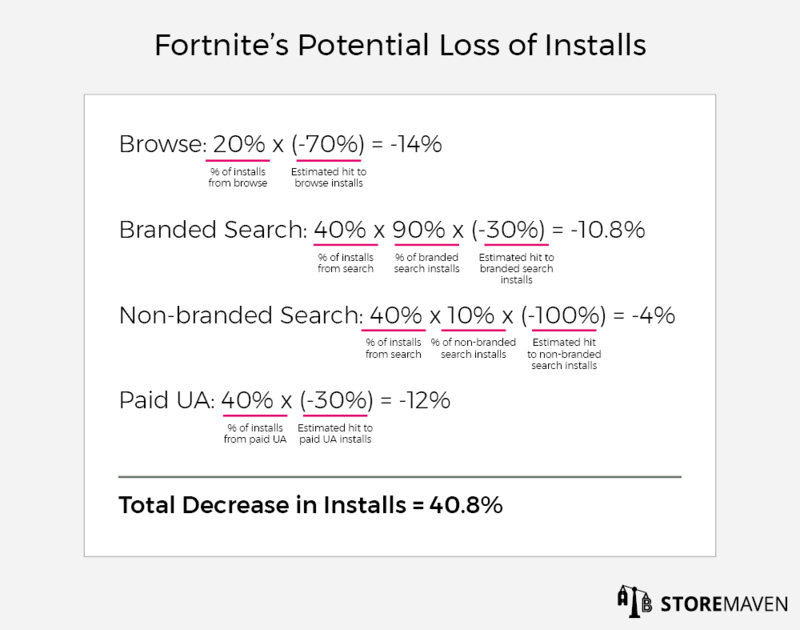 Along the same lines, we estimate that most of the high intent users who would’ve installed from branded search will try to search for Fortnite on the Google search engine and start the APK installation journey. 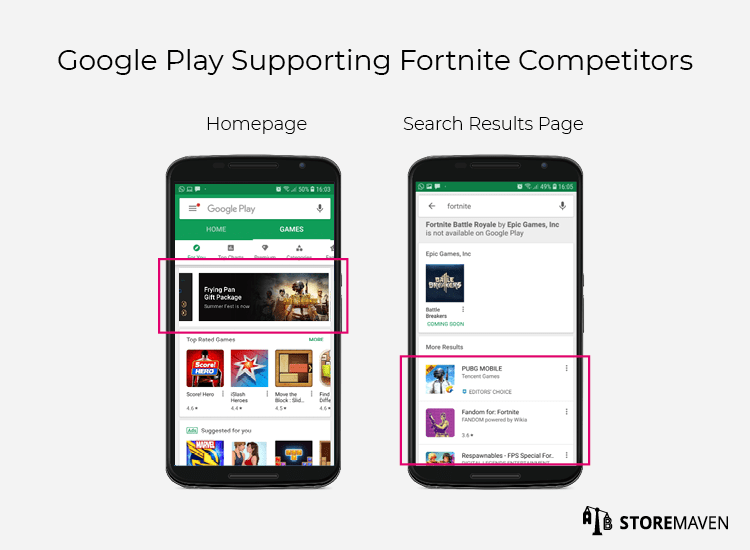 We believe that 100% of the non-branded search installs (for example, users searching for “shooter game” and seeing Fortnite in the search results) will be lost since those users won’t be exposed to Fortnite on the Play Store and won’t actively try to install it through the APK. This is due to their low intent and lack of brand awareness. For UA traffic, we expect Fortnite will experience 30% less installs given the higher-friction APK install process. 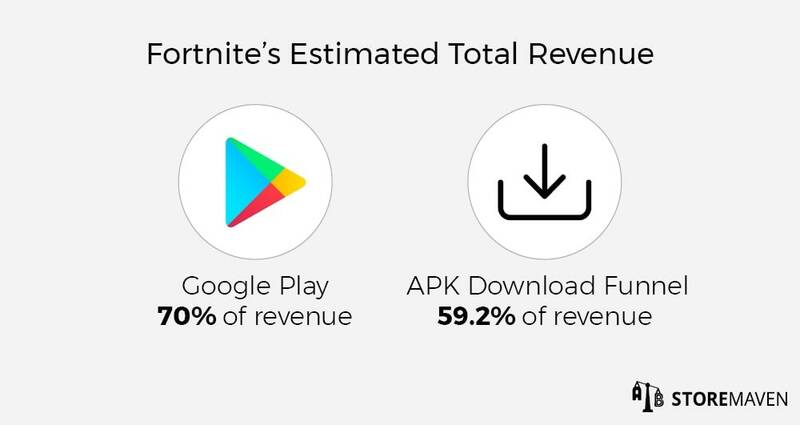 The final number shows that by going the APK route, Fortnite will experience about a 41% hit to its install numbers compared to the alternative situation of publishing on Google Play. If, for simplicity reasons, we assume that revenue is correlated 1:1 with the volume of installs, Epic Games will see almost 41% less revenue by publishing independently. This means they would only receive 59.2% of revenue compared to the 70% of revenue they’d collect if they published on Google Play and paid the 30% fee. They will likely mitigate this loss with an increase in UA spend, which will further impact their profit. Moreover, this goes to show that for many other developers who don’t have an extremely powerful brand like Fortnite, the impact could be even worse than ±40%. 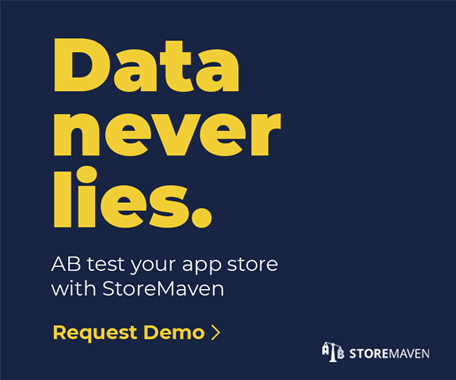 From a business and growth perspective, we believe this approach is much too risky for most mobile developers to test. 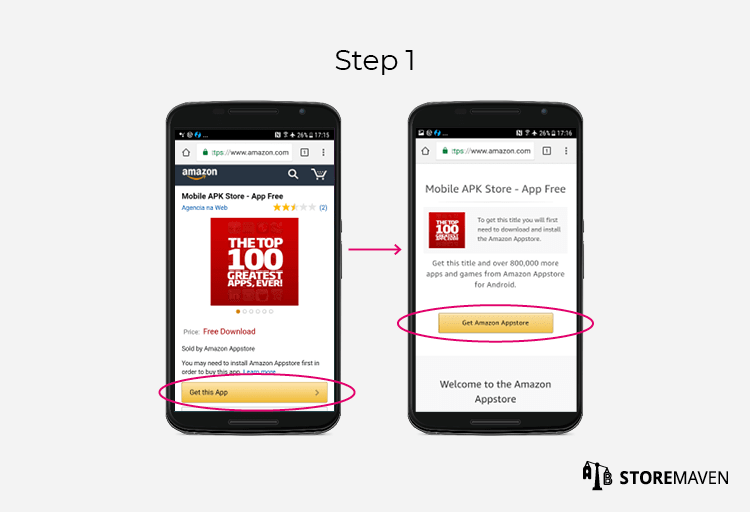 Step 1: Users, whether coming from a Google search or from paid UA campaigns, must land on the company’s website with the APK download link. Step 2: Upon clicking the “Get” button, users are brought to a new page with download instructions. Before continuing, they must click “OK” to a message from Google saying these files may “harm your device,” which can easily deter them from downloading. 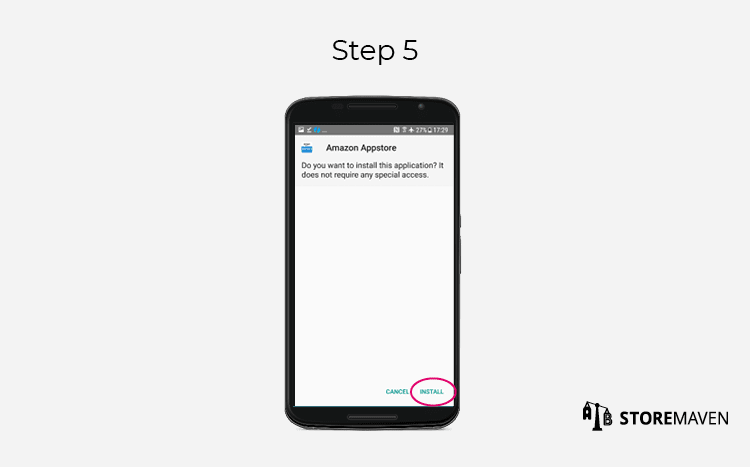 Step 3: Users must go into their security settings and turn on “Unknown sources” before the app will begin downloading. Before changing the setting, Google places another warning to inform users that they are responsible for any damage or loss of data as a result. This creates additional friction in the funnel and may discourage users from continuing with the download. 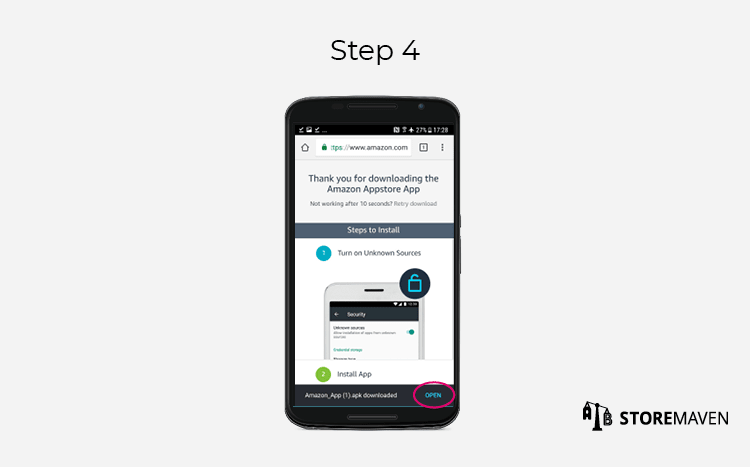 Step 4: Users must go back to the APK website to open the downloaded app. 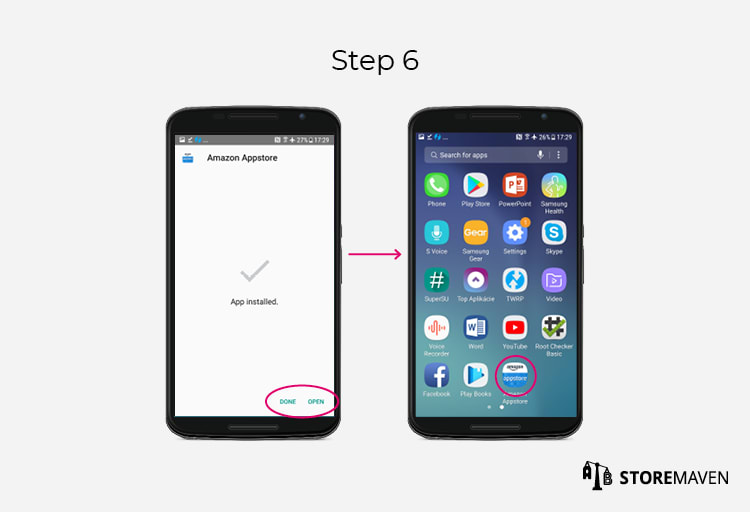 Step 6: The app will automatically install, and users have the option to open it immediately or click “done” and exit the funnel. At this point, the app will now appear on the device’s home screen. While doable, compared to the frictionless install users are accustomed to experiencing on the Play Store, this funnel requires significantly more time and effort to complete and may cause a decrease in conversion. Plus, the multiple security messages Google includes along the way act as further barriers to install. How Will Fortnite’s Distribution Strategy Affect the Mobile App Ecosystem? 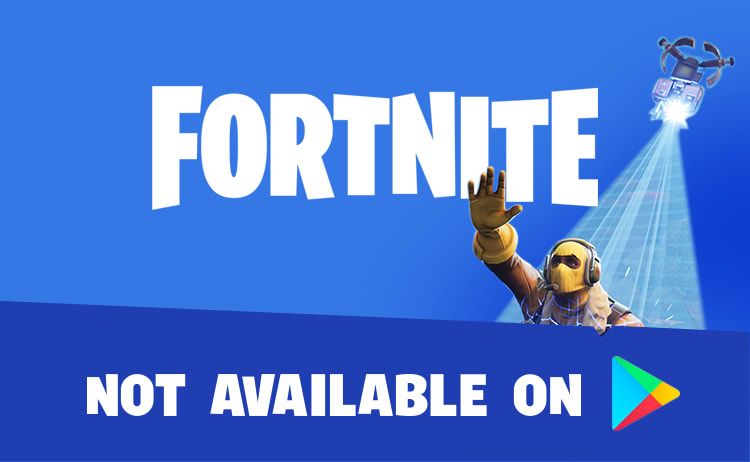 Given the potential hit to CVR and unprecedented nature of their decision, Epic Games are taking a risk by launching Fortnite without the support of Google Play. Although Fortnite, one of the most successful and fastest-growing games of all time, may be able to operate off of Google Play to its advantage (despite the possible loss of installs), a similar decision could be disastrous for most other developers. Fortnite relies heavily on the unparalleled hype created from desktop, console, and the App Store, but this success is not easily replicated. Despite these odds, it will be interesting to see how this decision will impact the industry, and whether other major mobile publishers will follow suit and determine that using a third party distribution platform isn’t necessary. As we all eagerly wait for the situation to play out, stay tuned for Part 2 of this series, in which we’ll dig even deeper into the impact this decision could have on the mobile app ecosystem and its major players. Great analysis although it doesn’t take into consideration that the casual players who might stumble upon the game in the Play Store top charts or browsing would maybe be users with low tier Android devices that don’t properly support a 1GB APK.